We hired style by r as our hair (Katie Rickun) and makeup (Rebecca Ross) team for our September wedding. I personally selected each of them based on the pictures of their work on the style by r website. They both exceeded my expectations. Katie was able to hammer out one style after the next. Each one totally different than the previous one but all of them looked stunning! She even style my mom’s wig for her and offered different ideas on how to style it. Rebecca made each of the girls feel beautiful with their makeup whether it be a more bold look or something more simple and natural. Each look was stunning! I changed up my entire look between the trial and the wedding day and she totally nailed it without batting an eye. Thank you so much Sara for the kind words. Katie and I loved being part of your day and are so happy that everyone loved their style. You all looked stunning! Rebecca I can never thank you enough! We got lots of compliments on the hair and makeup done by Rebecca and Marissa. It definitely had the day that much more magical! I would recommend this company to anyone who is having an event and in need of hair and makeup done! I cannot say enough about Rebecca. My experience with working with her was nothing but positive. Rebecca was super organized with timing, and was able to get 12 girls makeup done without any of them looking rushed. She was also super responsive and listened to what everyone girl was looking for. I would highly recommend using her and her team. Thank you Erica! I loved being part of your day and am so glad everyone was happy! You all looked beautiful! My experience with Style by R was amazing! Rebecca was super responsive and was great with answering any questions I had. Very flexible too. My stylist was Ashley and it was a pleasure being styled by her. I had inspiration images of the look I wanted and she worked with me to achieve the hair and makeup that I was looking for - casual classic low updo and a natural look for my makeup. I was so please with her work! It was even better the day of. Shannon also helped to style my bridesmaids and she did an amazing job as well. Highly recommend!!! Thank you Kristin! It was my pleasure to take care of you throughout your planning process! Our team loved being part of your special day! Everything was perfect! Shenna was my stylist and she truly delivered. The services are a bit pricey but honestly worth every penny. I am so happy to hear everything was perfect for you Lauren! We loved being part of your special day! We hired style by r as our hair (Katie Rickun) and makeup (Rebecca Ross) team for our September wedding. I personally selected each of them based on the pictures of their work on the style by r website. They both exceeded my expectations. Katie was able to hammer out one style after the next. Each one totally different than the previous one but all of them looked stunning! She even styled my mom’s wig for her and offered different ideas on how to style it. Rebecca made each of the girls feel beautiful with their makeup whether it be a more bold look or something more simple and natural. I changed up my entire look between the trial and the wedding day and she totally nailed it without batting an eye. Thank you ladies!! Thank you Leann! We love to hear from our brides and know that everything was loved by all! Thank you for the pictures, everyone looked so beautiful! Bridget with Style by R provided make-up services for my wedding day, as well as my mother and 2 bridesmaids. She did a PHENOMENAL job and we couldn't have made a better decision. She listened to our requests and the results were way more beautiful than we could have pictured. 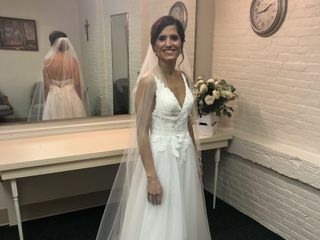 She was extremely friendly, early on the day of (which is the best way to keep a bride at ease that day), and worked so smoothly and efficiently. I highly recommend Style by R, especially Bridget, for make-up services. Thank you! Thank you Samantha! We are so happy you were pleased with our services. 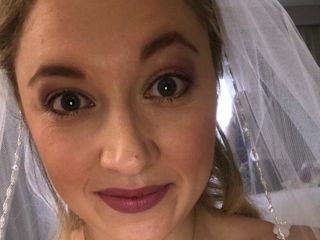 Bridget loved being part of your special day! Congrats to you and we wish you a lifetime of love and happiness! Thank you Jessica! I'm so happy to hear that, my team loved being part of your special day! I would recommend Style by R for any wedding. Rebecca was wonderful & did a fantastic job! Would definitely recommend her! Thank you Kristen, I hope you had a wonderful day despite the rain! Style by R made selecting a hairstylist very easy. Rebecca coordinated everything wonderfully and Gina and Ashley were wonderful to work with on the day of! Thank you Katie, my team and I were so glad to be part of your special day! Rebecca and her team did an amazing job for us! They did 8 people in my wedding party the morning of the wedding and it turned out great! I loved what Rebecca was able to do for me! She took three different styles and incorporated them all into one fabulous hairstyle! She captured exactly what I envisioned for the big day - so much so that I was in tears when I saw the final product during our trial run! I would highly recommend Style by R and her team for anyone's big day! They were fantastic also because they came to us at the hotel and were very reasonably priced to take care of us on site! She also did my mother's makeup which was beautiful! 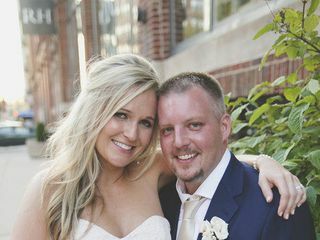 Thank you Leah for the kind words, we had so much fun being part of your big day! I would highly recommend Rebecca for any event. I wanted a fresh natural look and she gave me just that. 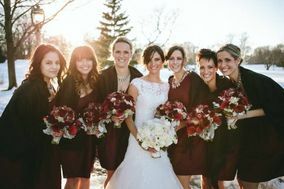 I can state that the other girls a part of my bridal party were equally impressed with the work of Rebecca and we all felt beyond beautiful all day long thanks to her! I'm so happy to hear that! It was my pleasure to be part of your special day! Rebecca, Jen, and Stephanie from Style by R did an amazing job on our hair and makeup. Rebecca was extremely flexible during the scheduling and planning process which I very much appreciated! Both times I saw her (trial and wedding day), she was incredibly professional but also down to earth enough for fun chit chat during the styling! I would highly recommend Style by R’s services to anyone for their wedding! Thank you so much for kind word, we loved being part of your day! Rebecca and her team were so easy and fun to work with! Very organized and made the morning of go by smoothly, they got all 14 of us looking beautiful in an impressive amount of time!! Thank you Kerry for your kind words, it was a pleasure to be part of your special day! Extremely flexible with my hair trials as I changed my mind with what I wanted a few times. Rebecca wa awesome and we loved having her do our hair and make up! It all turned out great! Loved Style By R for my wedding!!! Rebecca and her team were awesome! They came onsite to our venue and myself and all my bridesmaids were thrilled with our hair and makeup. Rebecca was a great communicator, took the time to learn about exactly what I was hoping for and made it a reality! Plus Rebecca and her team made getting ready fun and a memorable part of the day! Rebecca and her team were great! I live out of state and working with Rebecca was a breeze. She was willing to talk with me on the phone before I made my decision to have her do my hair and makeup. She was flexible with scheduling my trial when I was in Milwaukee. After the trial, I decided I wanted some changes to my hair & makeup, and she was able to execute what I wanted on the wedding day easily. Rebecca was incredibly helpful with creating the day of schedule and being able to work with my needs. She even finished early! It was great that she was able to come to the venue to our hair and makeup. The price was reasonable for both my trial and actual wedding day hair & makeup. I would highly recommend Rebecca! It was such a pleasure working with her. Thank you Amanda for your kind words! It was a pleasure for my team and I to be part of your special day! Rebecca was so much fun to work with and she did an amazing job for myself and my bridesmaids. My makeup lasted the whole night through with not a single touch up. she did a great job with my hair as well and her assistant was great with the bridesmaids hair..even giving one of my girls with very long hair an adorable chin length bob. I highly recommend her services. you will not be disappointed. Thank you Heidi!! It was such a pleasure to be part of your day! 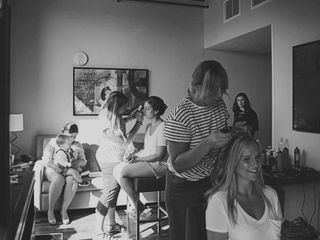 Choosing Rebecca and her team to do the hair and makeup for my wedding was one of the best choices I made. My bridesmaids and I have never looked so good. Rebecca listened to everything we wanted and delivered a highly professional and cohesive look for us all. 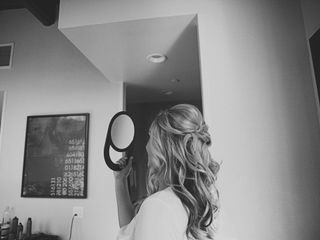 You are guaranteed to love you look with Rebecca and her team, not to mention the relief that comes with a stylist that comes to you on your big day. Thank you Lauren!! It was such a pleasure to be part of your special day! You all looked stunning! Style by R handled my make up in addition to 4 of my bridesmaids'. From the start, owner Rebecca (who handled our makeup) was fantastic to work with. She was prompt in responses and followed up as necessary. During the trial, I showed her some ideas of what I was thinking, and she nicely captured the look I was going for. I also loved that the make look great both in person and on camera! Moreover, when during her time in the suite, she brought a lot of positive energy, adding to the fun of the day. Thanks Meredith, it was a pleasure being part of your day! 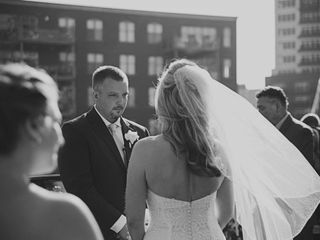 I booked Styled by R for my wedding hair and makeup as well as my wedding party's hair and makeup. Rebecca and her team (Katie and Shenna) were amazing!!! They were so sweet and made everyone look absolutely beautiful!! Rebecca knew exactly what I wanted and made it happen!! They were a fun addition to our "getting ready" experience and they laughed and joked along with us!!! Highly recommended!!! Thank you Katlin! We had a blast working with you and your ladies. I hope the first few weeks of marriage are treating you well!